I posted a great tutorial yesterday to turn tin cans into planters, but to be honest, I did not have enough cans for all my plants. So I needed to make something for dinner that will use these large tin cans. I was going to make my regular meatballs, but then decided that it’s time to play around and perk things up a bit. I modified my normal recipe till it was unrecognizable and the result was… delicious. I will be very specific with my steps and the order as I want to instruct you how to do this in the most efficient way, using as few dishes as possible. Feel free to do it as you want. 1. Combine all the meatball ingredients in a two quart saucepan. 2. Line a 9×13 baking pan with parchment. Combine sauce ingredients inside. 4. Cover and place on the middle rack in the oven. Be careful not to spill… Bake covered for 1 hour. Uncover and bake for another half hour. 5. While the meatballs are baking, prepare the rice. Start off by washing well and drying the saucepan you used as your mixing bowl for the meat mixture. 6. Heat the olive oil in the saucepan. 7. Add 2 cups rice and fry for approx. 2 minutes, stirring frequently. 8. Add the water and salt. Bring to a boil, then reduce to a simmer. 9. Let simmer for approx. 20-25 minutes, or until all the water is absorbed. 10. Serve meatballs on top of rice with a generous helping of sauce. 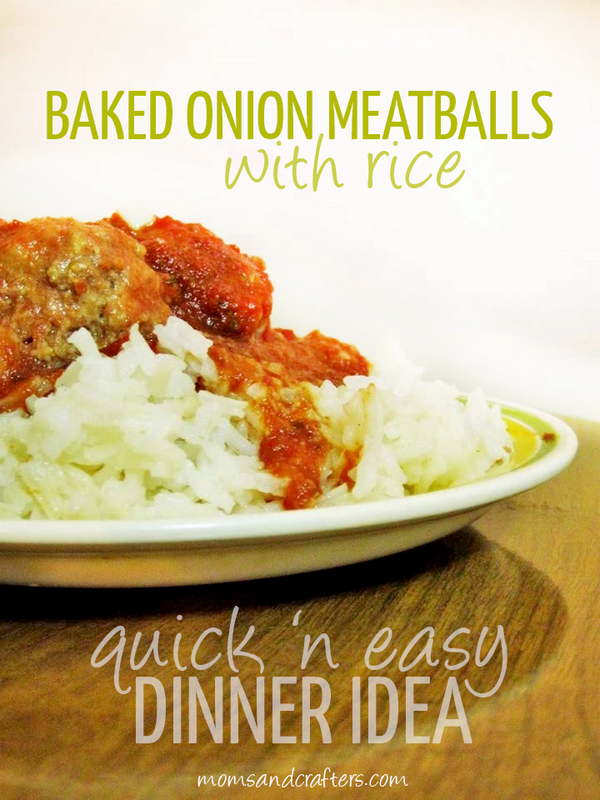 This baked onion meatballs with rice recipe can be made simpler by using as few dishes as possible. I included one way in the directions. Instead of mixing ingredients in a mixing bowl, I used a pot I will anyway be using for the next step. Another way I reduced the amount of dishes I used, is by using a small plate instead of a chopping board for the onions. I then re-used this plate as a spoon rest when cooking the rice. I did the same with the spoon. Once I was done preparing the meatballs, I washed the spoon and used it to cook the rice. I used the cup I cracked the eggs into to measure the rice. With this kind of system in place, you will avoid filling your sink with dishes as you cook and cleanup will be much easier. Do make sure, however, that anything that touches raw meat is washed with warm soapy water, or cooked well afterward. I line my pans with parchment to avoid contact of aluminum with my food. You can also cover with parchment under the foil, to protect your food from the top as well. Make sure your parchment contains only safe ingredients. Yum! It looks great! All the ingredients look very tasty and like they blend well together! I will try this! This sounds absolutely delicious! I will be trying this! I haven’t had homemade meatballs in quite some time, the pictures look fantastic.